“We were at an event in San Pedro and a man whose son suffers from multiple disabilities – the boy doesn’t speak, he’s not mobile, he has to be strapped into his chair. In the midst of all this commotion my miniature horse Liberty Belle noticed the boy and she went right up to him. She brought her head to his. These are the words of Victoria Nodiff-Netanel , founder of Mini Therapy Horses (www.minitherapyhorses.com), a non-profit, all volunteer organization based in southern California in the hills of Malibu. 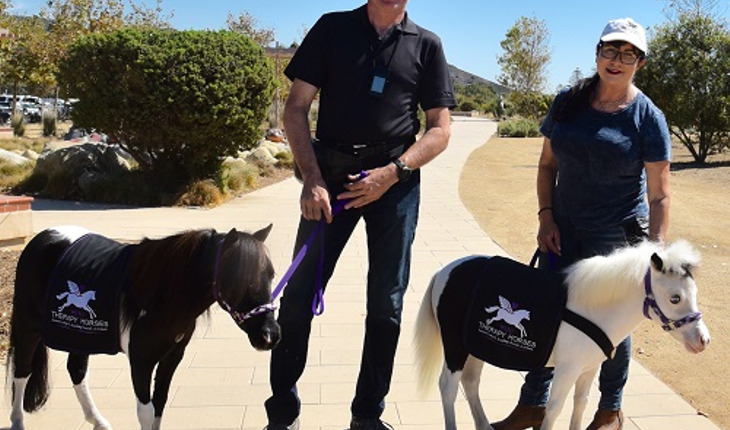 (That’s Victoria, above, with Steve Sullivan, vice president and co-founder, and two of the magical minis: Black Pearl, left, and Blue Moon, right.) Through partnerships with law enforcement agencies as well as children’s and veteran’s organizations including Ronald McDonald House, the Greater Los Angeles Veterans Hospital, the Los Angeles County Sheriff’s Department, and the Los Angeles Mayor’s Crisis Response team, Mini Therapy Horses are certified first responders providing equine-assisted interactions to people and groups in need of comfort and relief. Mini Therapy Horses relies solely on donations. For more information how to donate or volunteer, visit www.minitherapyhorses.com.